Much like herbal teas, compost tea can simply be described as a water extraction of compost; compost soaked in water to extract the many beneficial nutrients and more importantly the diverse micro-biology present in good quality compost. Once suspended into a liquid solution, the beneficial organisms in the liquid compost can easily be applied to soil, turf, leaf surfaces, compost heaps, ponds or other natural systems. "The point of applying compost tea is to return the biology that should be present, to grow the desired plants with as little effort as possible. There can be no question that presence of beneficial organisms improves plant growth" -Dr. Elaine Ingham et al, 1985, USDA Soil Biology Primer, 1995. Dr. Elaine Ingham has been a leading researcher and authority on the subject of compost tea, working to identify target organisms necessary for healthy agricultural and ecological systems. 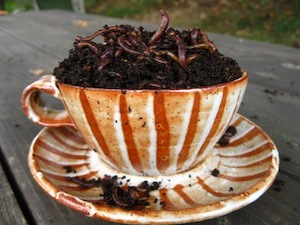 Home brewed compost teas are very affordable and serve as a living fertilizer, working extremely well in building a productive and healthy soil ecosystem. In addition, compost teas provide a healthy alternative to toxic chemical fertilizers and can be used on lawns, vegetable gardens, annuals, perennials, houseplants, shrubs, trees, orchards, forests, and vineyards with no threat to pets, livestock or humans. What does Compost Tea Do? Compost tea and compost extracts act as a probiotic for your soil. Digestive health is essential for the proper conversion and absorption of nutrients from our diet. Much like within our digestive tract, it is a diversity of key organisms within the soil that aid in the digestion or decomposition of organic matter and the conversion of nutrients into forms readily available to plants. The collective biology at work in soil is responsible for building humus and soil structure, assisting with water and nutrient retention, as well as the recycling and mining of nutrients and minerals. Compost extracts and actively aerated compost teas can improve the digestive health of your soils by inoculating them with billions of beneficial microbes. Building a diverse soil ecosystem teeming with life will help to improve the health and productivity of your farm and gardens. Specific organisms (fungi, bacteria, protozoa, nematodes, etc.) present in mature biologically active compost have been identified to aid in plant health and the suppression disease. Diverse biologically active soil and plant tissue has the capacity to form a protective barrier from disease and pests throughout a plants root and leaf zones thus out competing pathogens and parasitic organisms for food resources. "The problem in agriculture has not been a lack of nutrients, but a lack of the proper biology to make those nutrients available to plants." -Dr. Elaine Ingham, Soil Foodweb, Inc.
What is the difference between compost tea, compost extract, and actively aerated compost teas (AACT)? The term compost tea is used, broadly at times, to describe a variety of liquid compost and mineral solutions. Ideally, compost tea should be a cultured biologically active liquid compost possessing a full-diversity of the biology present in compost. Actively Aerated Compost Tea (AACT) is a water extraction of compost using high volumes of oxygen, thus maintaining a highly aerobic environment and a more precise cultivation and extraction of the beneficial organisms present in the compost. Aerated compost teas can be fed specific ingredients to cultivate select microbial life present in the mature compost. The increased oxygen levels and select foods added to aerated compost tea act as a catalyst feeding the diversity of organisms into an accelerated growth. Actively aerated compost tea can be applied as either a soil drench or as a foliage spray. For further reading on brewing and working with compost tea we recommend the following books. The links below will take you to studies, stories and other sites with great information on the use and effects of compost teas. - Soil Foodweb Inc. - This is Dr. Elaine Ingham's website and maybe the resource on compost tea. - Microbe Organics – This site is operated by Tim Wilson and covers microscopy of compost teas. He has a DVD available that show the different beneficial microorganisms in compost teas and compost, as well as a uniquely designed commercial tea brewing systems.